All our Group leaders have one thing in common - they have all walked the pilgrimage trails and have a desire to share their love of the Camino and Via Francigena with 'wanna-be' pilgrims! Because we want you to have the best possible experience we emphasise the need for you to walk your pilgrimage your way, at your own pace, no racing to keep up with fast walkers or dragging your heels to keep pace with slower walkers. The group leaders will always be there to accompany you if you need them but they are not tour guides and will not tell you how to walk Your pilgrimage. Dojema Theron is a South African, born and raised in the Little Karoo. She lived in Namibia for five years and settled in Stellenbosch nineteen years ago. She is passionate about hiking, nature, animals and travelling. She has hiked the Inca Trail in Peru and an Amazon Expedition. In Africa she has done mountain gorilla Trekking in Uganda, hiked the Fish River Canyon in Namibia, the Otter Trail, Whale Trail, Postberg, Outeniqua and the Hoerikwagga trails in South Africa. She regularly does walks in the mountains and nature reserves of the Western, Southern and Eastern Cape. In 2008 she discovered the Camino and embarked on her first Camino in 2009 walking the Camino Frances from St Jean Pied de Port to Santiago Compostela. She was captivated by the unique experience of walking the Camino and knew that she would walk again. On her return she encouraged others to walk it, assisting them with their planning. In 2012 she returned to Europe, walking the Camino Portuguese from Lisbon via Fatima to Santiago. After reaching Santiago she continued on the Camino Ingles from El Ferrol to Santiago and then continued walking to Finisterre and Muxia. The generosity, goodwill and kindness of people on the Camino motivated her to attend the Hospitaleros Voluntarios course presented by Sylvia in March 2016. She served for two weeks as hospitalero in the Albergue San Anton on the Meseta in June 2016. A week later she joined Sylvia’s group and walked the Via Francigena to Rome. She led a group on the Camino Frances in 2017. She has gained valuable experience organising, co-ordinating and leading groups on hikes, tours and adventure training. She works in the Wedding and Events industry and is fortunate to have the freedom to plan her work around walking and serving on the Camino. Brigitte first walked the Camino in Sept /Oct 2000. Upon receiving her first Compostela in Santiago in 2000 she was told that she was the first Namibian to have earned the certificate. In 2011 she walked the Central Caminho Portuguese; in 2015 the Tunnel Route from Irun to Santo Domingo de Calzada and the Camino Ingles from A Coruna to Santiago. In 2016 she did the Coastal Portuguese Camino from Porto to Santiago and included the Spiritual Route from Pontevedra via the coast to Padron. In South Africa she walked the Otter Trail 1982 and the Whale Trail 1999 and whilst living abroad she spent her weekends walking the Alps to Rocciamelone, Sella and a few others as well as the San Maria Gorge in Crete. Brigitte is a retired Swedish Massage Therapist and has a holistic outlook on life. She has also worked in the fast world of advertising as a Media Planner. These days she walks with groups in the Western Cape to keep fit. In 2017 Brigitte walked the Via Francigena from Siena to Rome and in 2018 she led the Camino Frances group from St Jean to Santiago in May. 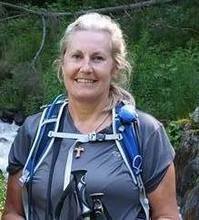 Brigitte qualified as a HOSVOL (Hospitaleros Voluntarios) volunteer in February and aims to serve in Spain or Portugal She is looking forward to sharing her passion for the outdoors, hiking and for the Camino with her group. Marion was always involved in some form of sport or gym. She started walking in 1995, joined a club and did a lot of competitive race walking for a few years entering numerous full and half marathons In 1999 she did the 80k Cape Town Big Walk; in 2000 the Comrades Marathon with Syl and in 2001 the Coast-to-Coast in walk in England with Syl. ​Marion no longer does competitive walking, but enjoys hiking and walking for fun. The bug bit hard after walking to Rome on the Via Francigena with Syl in 2006 and she walked the 800 km Camino Frances in Spain with Syl in 2007, the Camino Aragones and Camino Ingles in 2009 and led a Camino group for amaWalkers in 2015. In 2016 she led an amaWalkers group from Switzerland to Rome on the Via Francigena. Marion is looking forward to returning to the Camino Frances to lead a group in May 2019. ﻿Sylvia, one of the founders of amaWalkers Camino, is a peripatetic traveller and self confessed pilgrimage addict who is passionate about the Camino and about encouraging others to walk 'The Way'. In 2001 she organised a walk across England for 10 people. She organised her first Camino walk in 2002 on a 750km trek from Roncesvalles to Santiago. When she returned, she joined the newly formed Confraternity of St James of South Africa and was the Regional Co-ordinator in her Region for 7 years. She conducts annual Practical Pilgrim workshops for new pilgrims and St James Feast Days in July of each year. In 2004 she walked over 1 200km on the Via Turonensis from Paris to Spain and earned her second Compostela, walking the same year from Sarria to Santiago. In 2006 she led pilgrims on a 700km walk from Lake Lausanne in Switzerland to Rome on sections of the Via Francigena pilgrimage trail. In 2007 she returned to Spain, co-ordinating a walk on the Camino Frances and in 2009 she led a walk from Lourdes in the South of France, crossing the Pyrenees at the Somport Pass onto the Camino Aragones to Pamplona in Navarre. She has also walked the Camino Ingles to Santiago twice and from Santiago to Finisterre. She has led amaWalkers groups on the 22-day amaWalkers Camino since 2011 and in 2013 and 2014 she assisted groups of not-so-able people on the last 100 km of the Camino Frances and Camino Ingles to Santiago. Sylvia is an accredited HOSVOL (Hospitaleros Voluntarios) trainer in South Africa and has trained over 180 new volunteer hospitaleros so far. She served for two weeks as hospitalero at the San Roque albergue in Corcubion after training in the albergue in Finisterre and for 2 weeks in the San Anton albergue on the meseta in 2015. She is the author of a number of Camino books including the pilgrim planning guide “Your Camino, on foot, bicycle and horseback in France and Spain", a historical novel "Pilgrim Footprints on the Sands of Time", co-author of "La via Francigena: Five Pilgrims to Rome" of "Camino Lingo - English/Spanish Words and Phrases for Pilgrims on el Camino de Santiago." Her latest book is 'Slackpacking the Camino Frances' for people who do not want to stay in dormitories or carry their packs every day. In May 2017 she walked a Slow Camino from Sarria to Santiago in memory of Donna Felisa Medel from Logroño whose 84 year-old daughter, Maria, still offers Felisa's famous sello offering 'Higos, Agua y Amor' (Figs, Water and Love) to passing pilgrims. In 2017 she promoted and planned the creation of the Abbot Pfanner Trappist Trail in South Africa and in October led a group of not-so-fit pilgrims on this new trail. South African born Jenny Rooks (a Director of amaWalkers Camino) is an ardent hiker and walker who says she is ‘totally addicted to the Camino’. She is also passionate about sharing her love of the Camino with all prospective pilgrims and helping them to achieve their goal. Her addiction to the Camino began after attending one of Sylvia’s annual workshops on the Camino. She walked her first Camino in 2011 from St Jean Pied de Port to Santiago. In February 2012 she completed a Hospitaleros Voluntarios training course run by Sylvia and served as a Hospitalera at the parochial pilgrim shelter in Grañon She also walked the Camino Aragones and Camino Frances again in September and October 2012. In 2013 she lead the May/June amaWalkers Camino group on the Camino Frances and in 2014 a September group on the same route. In May 2015 she led a group of amaWalker pilgrims on the 'Complete Your Camino" from Logrono to Finisterre and In 2016 she led a group on the Via Francigena to Rome. Jenny is a highly experienced hiker and is actively involved in her local club, Durban Ramblers and Hiking Club, where she organises the hiking programme and is a hike leader. She lived in London for almost a decade until 2005 and during that period, she walked all over England, and hiked in Spain and Sicily. Leading groups of people is not new as Jenny gained experience with taking groups on holidays during her career in public relations. While she was at the University of Natal, she organised and led 3 tours to Madagascar for graduates of the university, as well as an annual bus tour for 44 alumni exploring all the Anglo-Boer War battlefields. In 2017 Sylvia asked her to join her in the formation of the Abbot Pfanner Trappist Trail in Kwa-Zulu Natal and she led the first official group on the trail in September 2018. Jenny feels very privileged to be able to help pilgrims along their journey to Santiago, Rome or the new Abbot Pfanner Trappist Trail in South Africa.